It winds along the Vara river, the Val di Vara is the largest and the least populated territory of the La Spezia area, with a low density of human settlement and large spots of unspoilt nature. The Val di Vara is the largest and the least populated territory of the La Spezia area, with a low density of human settlement and large spots of unspoilt nature. It winds along the Vara river, on the banks of which stand ancient castles and villages, in a territory which in the Middle Ages was often disputed between Genoan wealthier families and Florence and Tuscany feuds for the control of its important routes and inhabitated centers. The strategic importance was over time witnessed by te growth of artisanal activities and craftmanship. Their spreading in the valley was a reference point in northern Italy. The Valley is still constellated with fascinating hamlets and fortresses, offering charming views all over the valley. The Val di Vara is a great place to stay if you love uncontaminated nature and enjoy some cool air during your stay in the area in the hottest summer days, as the climate is very different from the one of the nevertheless close coast. In winter it can actually be very cold as well. Val di Vara has some very well preserved ancient villages, so typical in the multicolored house facades, the narrow streets and picturesque squares. 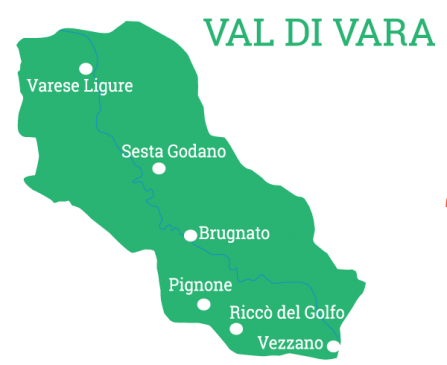 In summer, the Val di Vara is a great area to enjoy the Sagras, food festivals of local food, because in the area you have many farms for the production of genuine vegetables, diary and meat products. The Val di Vara has been the center of a catastrofic flood in 2011. Reconstrunction has been going on ever since, in the name of bio productions and green power. By car, the easiest way to get to Val di Vara is by own car.